Faber Castell-PITT Artist Pen Set. 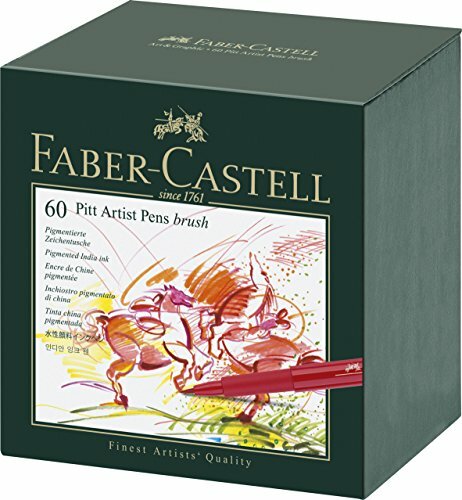 Made with high quality pigments Faber-Castell PITT Pens have without acid archival India ink. They are odorless permanent lightfast and smudge proof/waterproof when dry. Unlike traditional markers they will not bleed through paper. Use on canvas fabric wood and ceramics. The brush nib can be refreshed by simply taking it out and turning it around. This 6x6x4 inch package contains sixty PITT artist pens in assorted colors. Archival quality. Conforms to ASTM D4236. Imported. The shafts and caps of Faber-Castell markers and fibre-tip pens are made of polypropylene (PP) to protect them from drying out quickly. Their ink will last for years. The product also has a minimal environmental impact after use, because PP burns like candle wax. If you have any questions about this product by Faber-Castel, contact us by completing and submitting the form below. If you are looking for a specif part number, please include it with your message.